Do you want to customize your website without the help of a web developer? A WordPress page builder plugin not only allows you to do that but also lets you build pages from scratch. And the good news is you can do that without writing a single line of code. In this article, we’ll compare the best drag and drop WordPress page builders to help you get started quickly. Do You Really Need a Page Builder? Have you ever wanted to design a page based on your requirements and without depending on someone else? If you said yes, then a page builder will solve your problem. Most of the WordPress page builders use their drag and drop interface to make life easy for you. You can customize your site in the frontend and see the changes in real time. For example, you can easily add an image, button, or a simple contact form to your site by simply dragging and dropping the elements. You can also change the color of your heading, add borders, increase the font size of your content, and more. The best part is you can make all these changes to your website without any programming knowledge. So you can save your money by not hiring a web developer and do everything on your own. What to Look For in a WordPress Page Builder? The next big question is how to decide which page builder is suitable for your needs. With so many free and premium plugins in the market, this can be a difficult decision to make. Ease of using the page builder to build or customize pages. Allows you to create mobile-friendly websites. Availability of useful features like drag and drop interface, styling options, pre-built templates, and other content elements. Compatibility with your existing WordPress theme. With the above points in mind, let’s get started with the list of the best drag and drop page builders for WordPress. Beaver Builder is one of the best WordPress page builder plugins that comes with tons of features. It’s a Gutenberg-ready plugin and is also compatible with almost every WordPress theme. This plugin comes with a live frontend editor that allows you to customize your pages in real time. It provides different modules including sliders, galleries, social buttons, testimonials, counters, and more to help you to create whatever you want. You can also click on any element to style it without writing any code. Beaver Builder offers more than 30 pre-built landing and content templates. You can select a landing page template you like the most and customize it based on your needs. This saves your time as you don’t have to start everything from scratch. Along with landing pages, it also comes with content templates like pricing tables, about page, services, portfolio, and team page so that you can build the inner pages of your website. This plugin supports the use of shortcodes and widgets. So, you can use other plugins with this page builder to take your site to the next level. For example, you can easily add a WPForms subscription form using the shortcode functionality and build your email list. Do you want to test the plugin before purchasing it? You can do that as Beaver Builder allows you to try all its features, thanks to their live demo. It also comes with a free version that lets you play with the plugin on your website. But you should note that the lite version offers limited functionality. Price: Starting from $99 for unlimited sites. Divi is a popular page builder plugin and has been created by Elegant Themes. It’s a true visual page builder that lets you create stunning pages for your website using its drag and drop interface. This plugin comes with over 20 pre-designed templates to help you get started quickly. You can select one of them, make changes as per your needs, and even save the layout for future use. Not only that, but you can also import and export your layouts easily. Want to edit the heading or a part of your content? Just click on the heading or the text area and start typing instead of opening a settings panel to do the same. Cool, isn’t it? Divi provides 46 different content elements including accordion, pricing table, audio player, call to action, buttons, and more using which you can build your website based on your imagination. You can also use rows and various column types to help your cause. This plugin lets you customize every element on your page without any hassle. This includes changing fonts, colors, spacing, and size. If you’ve CSS knowledge, you can even add custom CSS code to any element. To use Divi page builder plugin, you’ve to purchase their yearly membership plan. But the best part is you’ll get access to all the themes and plugins of Elegant Themes with that subscription. Price: Starting from $89 per year for unlimited sites. You can also get lifetime access for $249. With more than 2 million active installs, Elementor is the best option for those who are looking for a free drag and drop page builder. It comes with 300+ element blocks that can be used to build stylish pages for your website. You can easily drag and drop the elements, edit them, and preview everything in real time. Elementor supports undo and redo functions, so you can go back to any changes that you made earlier. You can also go to the revision history to check and use all your previously saved versions. This powerful plugin allows you to build mobile-friendly web pages. So you can hide or show elements, change font size, and reverse column order for different screen sizes like desktops, tablets, and smartphones. One of the features of Elementor page builder that needs special mention is a built-in maintenance mode. Thus you can show a coming soon or under construction page to your visitors when you’re making changes to your site. Isn’t that great? While the free plugin offers useful options, you can always upgrade to Elementor Pro to get extra features. Customize the header and footer of your site. Use over 50 premium widgets. Build an online store using the WooCommerce Builder. Add custom and Typekit fonts to use them on your pages. Last but not least, Elementor provides 100+ elegantly designed landing page templates for both their free and premium users. You can find templates for almost every niche and customize it as per your wish. Price: Free. However, you can upgrade to Elementor Pro for $49 per year for a single site. Themify Builder is another free page builder plugin on our list. It’s a simple yet powerful drag and drop page builder and has been built by the Themify company. It offers more than 40 pre-designed layouts to make your job easy. So you can import the one you like, edit the content, preview the change live, and publish the page within a few minutes. Just like Elementor, this plugin allows you to undo and redo any changes while editing your pages. You can also copy modules from one page to another if you want to reuse certain part of the page layout. Themify Builder comes with 25+ premium addons to extend its functionality. For example, you can use the Maps Pro addon to customize your map using 4 different map types, 40+ map styles, and unlimited location markers. On the other hand, Typewriter addon can be useful for adding your text with typing animation effects. Some of the other addons include WooCommerce, Slider Pro, Bar Chart, Contact, and Progress Bar. Price: Free. You can purchase Addon Bundle for $39. Visual Composer is one of the most popular drag and drop WordPress page builder plugins. Its user-friendly interface makes it super easy to create stunning pages for your website. 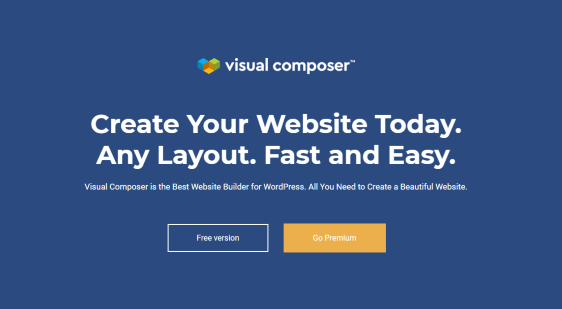 Like every plugin on our list, Visual Composer is compatible with almost any WordPress theme. It also works with every custom post types along with your posts and pages. This plugin comes with some powerful design options to give you total control over your website and that too without any coding skills. You can change backgrounds, add borders, use parallax effects, and a lot more. Build custom header, footer, and sidebar for your site. Includes professionally designed templates and content elements. Create online store using WooCommerce module. A single site license of Visual Composer will cost $59 per year. However, it also offers a lite version with limited features. And you can always test the free version before upgrading to their premium product. Price: Starting from $59 for a single site. Which WordPress Page Builder Is Best? After comparing the above plugins, we can conclude that Beaver Builder is the best drag and drop page builder for WordPress. Plus, Divi is another plugin that we can highly recommend. However, if you’re looking for the best free page builder for WordPress, then Elementor page builder is the best for your needs. Anyways, we hope this article will help you to find the best page builder plugin for your WordPress site. If you’re not using WPForms so far, get started with WPForms today! It’s the best drag and drop form plugin in the market. Also, don’t forget to follow us on Twitter and Facebook to get updates from our blog.